FOR the individual passenger, his embarkation in a giant liner may be a notable event. The voyage may open a new epoch, holding the promise of adventure and romance. Yet the beginning of an ocean voyage is the reverse of dramatic. It is as matter-of-fact and as easy, so far as the passenger is concerned, as boarding an omnibus. Armed with tickets and passport, he travels in a comfortable boat train, walks to a barrier where his papers are quickly examined, and goes aboard. Later a few concise orders are passed to all concerned, the ship’s siren blows, and she is under way. The great adventure has begun as easily as that. The real drama of sailing day lies in the complex preparations that are necessary, and in the organization which completes them so smoothly. A ship’s company is faced with a passage of days - or sometimes of weeks - during which it must be completely self-supporting. To achieve this, much must be done in advance. Let us examine the work of the quayside, taking for an example a great transatlantic liner, such as the Aquitania, the Bremen or the Normandie. These are some of the largest vessels afloat and thus present the greatest sailing problems. For all practical purposes a ship is stripped of personnel and contents after each voyage. As soon as she docks from one voyage, she must be prepared for the next. The work begins with the signing-off and paying-off of all the crew, and their re-engagement for the next voyage. The captain himself heads the list, signing a fresh agreement before each sailing. This is his first act upon docking. Immediately he sets about new preparations. He visits the Custom House, completes the formality of entering the ship’s arrival, and signs the papers for the outward voyage. Various official departments are concerned with the sailing of a ship: the Board of Trade, the Board of Customs and Excise, the Port Sanitary Authority, the Immigration Department of the Home Office (which deals also with emigration), Trinity House (or some other body), which supplies pilotage, and, of course, the Port Authority. Officials from these departments visit the ship constantly during preparations. The paying-off of the crew is under the management of the owners’ Shipping Department, and is attended by Board of Trade officials. Generally most members of a passenger liner’s crew sign on at once for the next voyage and receive the official embarkation pass to join the ship on the day before sailing; any new members of the crew are also signed on then. Under the Merchant Shipping Acts a ship’s company must be maintained at a regulation strength. This quota having been reached, the Board of Trade officials issue a form (Form AA) which is necessary before the Custom House “clearance” can be granted. From the Board of Trade and from the Admiralty come the urgent Notices to Mariners. These contain detailed information of any alterations in navigation rules, or in the positions of buoys, lights and channels. For instance, the entrance to Southampton Harbour, between Cowes Roads and Southampton Water, is an S-shaped channel which is continually dredged and continually shifting because of the set of the tides. Up-to-date information about such alterations is supplied in the current Notice to Mariners. The Mercantile Marine Department of the Board of Trade is concerned with many of the other stages of a ship’s preparation, culminating in the last stage of all, and the issue of “Survey 32”, explained below. Each stage may be examined separately, though the events do not occur consecutively. Any ship carrying over fifty third-class passengers is defined as an “emigrant ship”; so this term applies to a transatlantic liner. Board of Trade officials attend a muster of the whole crew of an emigrant ship on the day before sailing. At this the complete boat-drill, fire-drill and bulkhead-door-drill are performed. The drills are repeated early the next morning, this time with the crew equipped with life-belts. Another safety-measure consists in the Plimsoll-line (load-line or freeboard) regulations, and it is the duty of the Board of Trade to ensure that these are observed. To carry out this duty the Board of Trade may use one of two methods: a report from its own surveyors, or a report from one of the “Classification Societies”. The principal classification societies, so far as British ships are concerned, are three in number, and have been set up with the initial purpose of classifying ships for insurance. The best-known is Lloyd’s Register of Shipping, generally known as Lloyd’s Register, and not to be confused with the insurance organization. The other two are the British Corporation and the British Committee of Bureau Veritas. The Board of Trade has its own large survey staff; and, by using existing organizations also, is saved the great cost of maintaining a staff of surveyors sufficient to cope with every ship sailing from British ports. Upon receipt of the report that the load-line (Plimsoll-line) regulations have been fulfilled the Board of Trade issues its load-line certificate. This must by law be exhibited in the ship. The provisions ensured by the £2,000 penalty in the bond include that “the ship shall at the time of her departure be in all respects seaworthy”; that “throughout the voyage at least four quarts of pure water shall be allowed daily to each steerage passenger”; and that “any engagement made at the beginning of a voyage to call at an intermediate port for fresh water shall be fulfilled”. This is known as a continuing bond, so called because it is considered sufficient for each successive master to endorse the original bond. Although it is a Board of Trade form, its completion is generally entrusted to the Chief Customs Officer of the port - another instance of using the existing organization in preference to setting up a new one. LAST LINKS WITH THE SHORE. 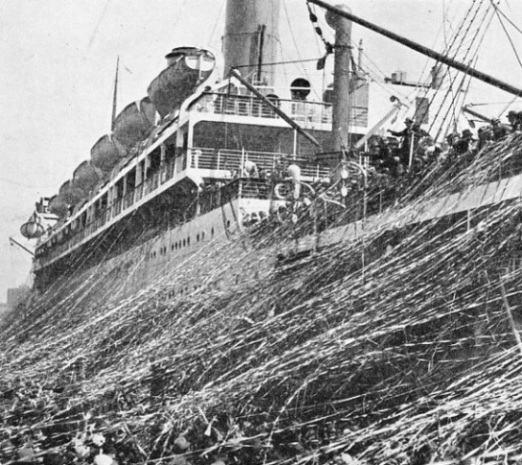 The gaily-coloured mass of streamers thrown down from the deck of an Orient liner on to a quay at Sydney break as the vessel moves away. The casting of streamers is an interesting custom symbolizing the break of ties with those ashore. The Orient Line to Australia has a fleet of eight steamers and operates mail, passenger and cargo services between London and Australia via the Mediterranean, Egypt and Colombo. The final form to be completed before the ship sails is the Board of Trade “Survey 32”, mentioned above. Before this all-embracing certificate can be obtained, the company’s shipping department must have satisfied the regulations of other official bodies. The department next in importance to the Board of Trade is the Board of Customs and Excise. Returns must be made to the Customs officers of dutiable supplies, such as food, drink, and tobacco, which the chief steward may wish to take aboard the ship. As they are for consumption afloat, these escape excise duty and so must be withdrawn from a bonded warehouse, where they are lodged under arrangements made by the Customs authorities. The appropriate returns are accompanied by a request for the release of such goods, or for their supply by various firms direct, free of duty. Once the supplies are aboard, a “Victualling Bill” must be filled out, giving detailed particulars of the dutiable goods taken aboard. The Customs officials must also receive from the captain a return of the total amount of dutiable goods which it is intended to carry as stores or cargo. A declaration of the total number of passengers outward bound from British ports is required also. On another form, oddly entitled “Entry Outwards”, the Board of Customs and Excise requires a report of the inward cargo still remaining on board, and a certificate of the exact position of the load-line above water. This supplies a quick and easily ascertained check against extensive smuggling, where a smaller ship is concerned, should the vessel call at another port in the United Kingdom. The Immigration Department of the Home Office is represented at the quayside on sailing day. It is the duty of its officials to examine the papers of outward - bound passengers. It may happen that they are also ensuring the departure of an unwanted alien who is being deported from Great Britain. MAKING READY FOR SEA. This is comparatively easy in a tanker, as shown above. In the liner, however, the Marine Superintendent is responsible for all the refitting, refuelling and repairs, and for the replenishment of stores. The various departments work under his control. He has to attend to the inspection of ship’s boats, the overhaul of deck gear and the testing of navigational instruments. The Marine Superintendent also arranges the time of departure and engages tugs and pilots. The Port Authority is not generally a government department, but its officials must be satisfied, before a ship sails, that all her port dues have been paid; and they are consulted as to the exact time for sailing. Their chief executive on the quayside is the Dock or Harbour-Master. In some ports they are the owners of the tugs, and then arrangements for tugs must be made with them. This does not apply in every port, as there are many privately owned enterprises which run tug-boats. Trinity House is the body controlling outside pilots in British waters, i.e. those outside rivers and ports. It is to this organization that application must be made for a pilot who will navigate the ship through coastal waters. The coastal waters are nowadays covered by the “choice” pilot who will handle the ship in compulsory waters. These official measures taken by law to ensure the safety and health of the passengers and crew are administered efficiently and with a minimum of officialdom. For about ships there is that which promotes comradeship, co-operation and easy running. While the ship is in dock, the Marine Superintendent is virtually her captain. He takes over as soon as the first hawser is made fast and relinquishes his responsibility only when the last hawser is cast off. Under his supervision all the papers are handled and passed through; refitting, refuelling, repairing and replenishment of stores are all carried out by the various departments under his authority. His work, well done, ensures that the ship about to sail is “in all respects seaworthy”. The work is even more complex than the formalities already described. There is so much detail, and so little time for hitches. The Marine Superintendent’s office - known also as the Shipping Department - is responsible for the co-ordination of all this work. His staff plans and organizes the routine of paying-off and signing-on the crew. 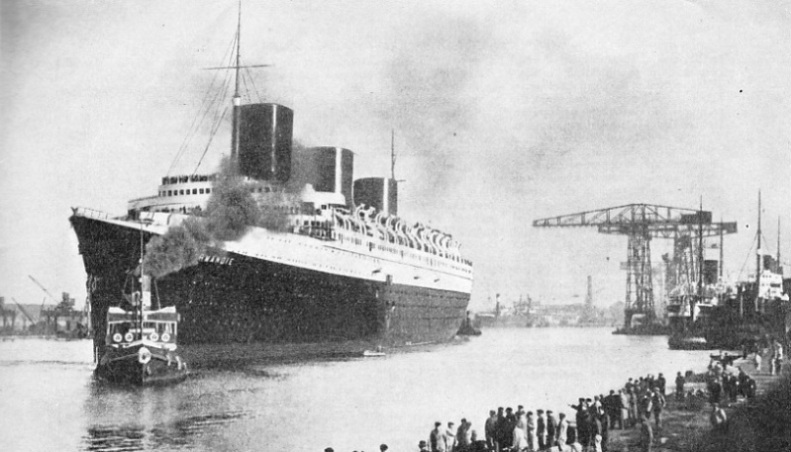 The Cunard White Star Company reckons to handle a crew of 1,000 men in an hour. The safety drills and inspection of the men by Board of Trade officials and by the doctor are under the Marine Superintendent’s direct control. He arranges also all the work to be done on the hull of the ship (as distinct from that done by the Engineering and Furnishing Departments, which carry out their own tasks). He directs the taking aboard of thousands of tons of fresh water and oil fuel. External painting and cleaning are in the hands of his department. The ship’s boats must be inspected, and necessary repairs carried out. Deck gear must be overhauled, navigational instruments and gear must be tested. Their efficiency depends on the Marine Superintendent’s thoroughness. Time of departure is arranged by him, and he engages the tugs and pilots. As stated above, his work is over only when the last hawsers are cast off and the great liner is under way. THE ENGINEERING DEPARTMENT has to ascertain that the great plant which drives the liner is in order before the ship can leave. Main propelling machinery, the auxiliary engines for operating winches, derricks, the cooking apparatus, the refrigerating plant, and heating and ventilation systems have all to be inspected and repaired where necessary. 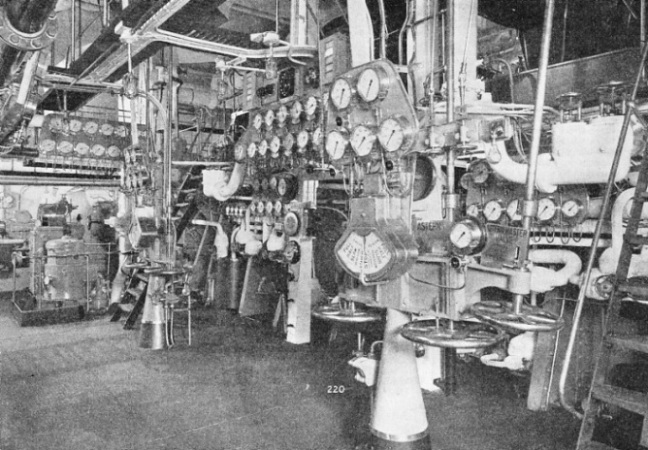 This photograph shows the engine-room control platform of the P. & O. liner R.M.S. Strathmore. This liner, built in 1935, has a gross tonnage of 23,428. Each of her twin screws is driven by a set of turbine engines through single-reduction gearing. Her designed speed is 20 knots. Meanwhile the other departments are ceaselessly at work on their own tasks. The Furnishing Department - its exact name varies in different companies - must first of all attend to the laundering of all soiled linen. Although many great liners have their own laundries aboard, these can by no means handle the whole volume of linen used during a six-days’ voyage. For example, every passenger has two clean towels a day; if the passenger list numbers 2,000 and the voyage is of six days, 24,000 towels are required. Indeed, it is not exceptional for the Furnishing Department to take 100,000 pieces of linen, attend to their laundering and return them to the ship within forty-eight hours. All this linen must be checked as it goes ashore and checked again when it is returned. The work is undertaken by selected stewards from the ship. The Furnishing Department, too, is responsible for all the furniture, carpets, linoleum, tapestries, curtains, hangings and pictures in the ship. The floor coverings alone may cover many acres. The interior decoration is in this department’s hands. Every time a ship docks some repainting of the passengers’ quarters is carried out; and every square inch is thoroughly cleaned. Yet not a painter, carpenter or joiner will be visible on sailing day. There is a rigid rule that all work must be finished before the passengers come aboard, and it goes ill with the department if the rule is broken. Below decks, in the engine-room, there is immense activity. The greatest task machinery is called upon to do across the Atlantic is to propel a vessel of many thousand tons, for 3,000 miles, and for six days without stopping. Other forms of transport all have their breathing spaces, but a ship’s power must not fail her. The Engineering Department must see that the vast motive power of the ship is unimpaired. The engineers first examine the main propelling machinery, which may develop between 15,000 and 150,000 horse-power. If signs of weakness are disclosed, the faulty parts must be replaced, tested and approved in the short time available. Then refuelling must be done. This is a less arduous business than in the old days of coal-burning. To-day an oil tanker or oil barges come alongside; working at full pressure, they can pump 7,000 or 8,000 tons of oil into the tanks in a little over twelve hours. When coal was used, hundreds of men took days to carry aboard from barges the baskets of coal and empty them down the coal-ports in the ship’s side. The resultant clean-up was a stupendous task in itself; coal dust seemed to penetrate everywhere. As well as the main engines and boilers, there is a mass of auxiliary machinery to be tested. Special machines are installed aboard a luxury liner to work the cargo derricks, anchor windlass, warping winches, steering gear, bulkhead doors, cooking machinery, refrigerating plant, heating and ventilating system, and sanitary and domestic water supplies. The electric generating plant alone develops sufficient power to supply current for a medium-sized town. The Superintendent Engineer, through his staff, must ensure that all this is in first-class condition. During the voyage the engine-room crew tends the machines with expert care; but since they must work continuously, there is no opportunity for a full examination until the ship is in dock. Apart from the machines themselves, there are hundreds of miles of pipes, cables and wires which must be inspected. 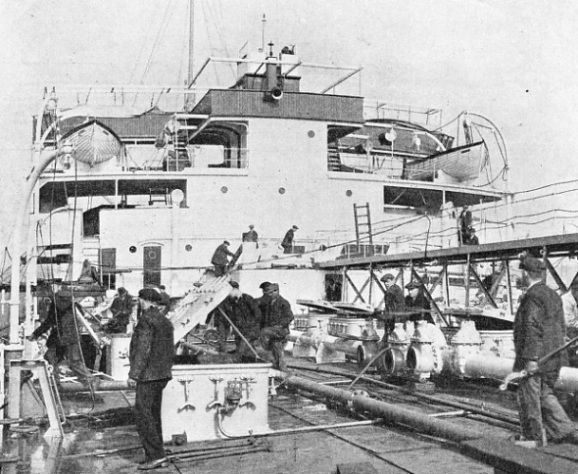 Not only must the shipping company’s staff be assured that all the machinery , is in a state of complete efficiency, but stringent Board of Trade regulations have also to be satisfied; and the Classification Societies, previously mentioned, insist on their own exacting standards on behalf of the insurance underwriters. Great quantities of engineering stores have to be taken aboard, in addition to the fuel, oil and water, for the main engines and boilers. There may be as. many as a dozen different kinds of oil used aboard the ship for lubrication, illumination and cleaning. Tool kits may have to be replenished or replaced. Cotton waste, soap, lime and soda, and carbon dioxide for the refrigerating plant, must all be supplied in sufficient quantities. PREPARATIONS FOR OVER 50,000 MEALS may have to be made by the Chief Steward and the Catering Department. 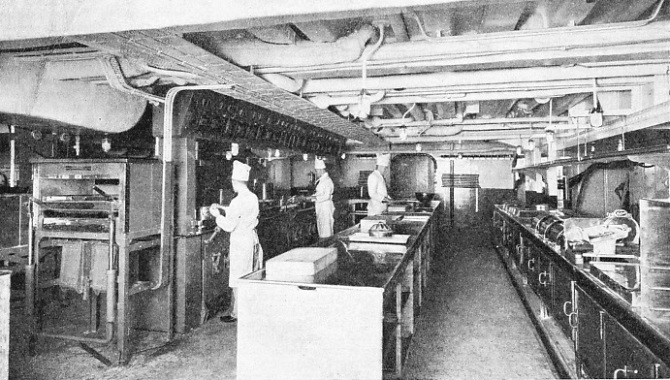 This photograph shows the modern kitchen in the P. & O. liner Strathmore. Her complement of 1,110 passengers and 515 crew involves the serving of nearly 4,900 meals a day if every berth is occupied. The voyage from Tilbury to Bombay takes nearly three weeks. The last job of the Engineering Department - unless the ship is a motor vessel - is to see that steam is available for the machinery when the telegraph rings down “stand-by”. The engines are “turned over” an hour or so before sailing, and the sirens are all tested to see they are clear. A long blast on these same sirens at sailing hour proclaims that the Engineering Department’s work is done, and that the ship is once more ready for her 3,000-miles adventure. She sails, a complete city, self-supporting. That there shall be no lack of necessities and luxuries is the responsibility of the Catering Department, which works in conjunction with the ship’s Chief Steward. His task, which resembles housekeeping on a gigantic scale, is to know the exact quantity of stores left over from the previous voyage and to calculate what he will need before the fresh voyage begins. He passes his estimates to the Superintendent Caterer, who arranges supplies. Since provision must be made for approximately 2,000 passengers and 1,000 crew, all eating three meals a day, some 9,000 meals are served daily. Thus 54,000 meals will be required during a six-days’ transatlantic crossing. And this does not take into account the mid-morning soup, afternoon tea, and the appetizing buffet-snacks which are served about eleven p.m. in the lounges. Moreover, in the first-class dining-room, the day’s menus generally offer a variation of more than a hundred dishes. Meanwhile, the kitchen equipment is inspected; utensils are repaired and replaced. A stocktaker goes over the inventory of china, glass, and earthenware, amounting to approximately 100,000 pieces, as well as 25,000 pieces of cutlery. Thousands of empty bottles are put ashore and replaced by thousands of full ones. In addition, all dutiable stores taken aboard, eatable or drinkable, must be reported on the Victualling Bill to the Customs. All surplus stores are listed and checked. The Freight Department is just as fully occupied. On a “quick turn-round” - as a short stay in port is termed - cargo is discharged as nearly as possible at the same time as the new cargo is loaded. All outward-bound cargo for the transatlantic liners arrives within forty-eight hours of sailing. There are many other detailed preparations for sailing. The ship’s doctor, for instance, must restock his dispensary. The library stewards take aboard new books, magazines and papers; they also procure a large quantity of stamps. More than 10,000 letters have been mailed during a single voyage. Electricians and plumbers attend to the gymnasium equipment and to the swimming pool. Wireless experts are busy in the radio room. There is even a ship’s gardener, who is in charge of the thousands of plants and flowers needed for decoration. When all the work is completed, the Marine Superintendent inspects the ship before handing over to the captain. He sees work superlatively well done; complex tasks which have been performed in the minimum time. The record “turn-round” for one of the mammoth liners at Southampton was accomplished in under twelve hours between docking and sailing. However accustomed the man in charge may be, the moment when the last gangway goes cannot fail to be a proud one - a moment filled with the sense of achievement. He and his expert staff have made that moment possible. 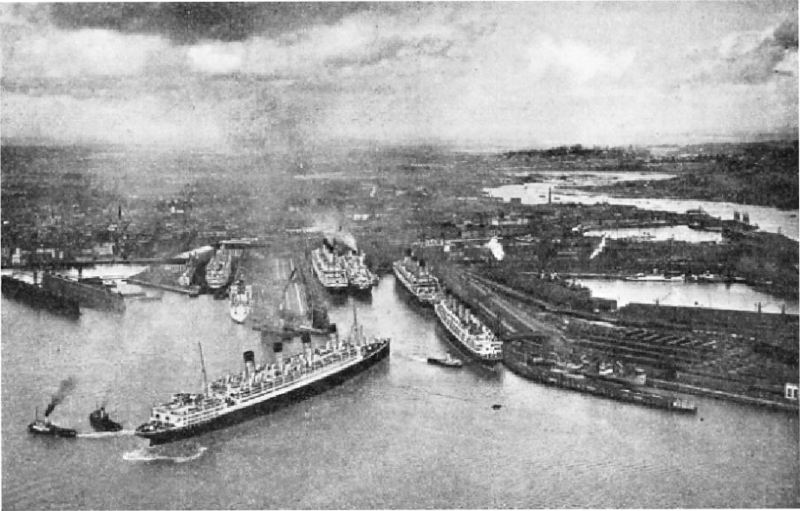 THE PREMIER PORT in the British Empire for the large liners is Southampton. This great port handles some thirty-seven per cent of the ocean passenger traffic of the United Kingdom. Above is an interesting picture showing the Aquitania (gross tonnage 45,647) being towed from her berth before beginning a voyage to New York. In the Ocean Dock are the Majestic (gross tonnage 56,599), the Berengaria (gross tonnage 52,101) and the Mauretania (gross tonnage 31,938). The Mauretania was sent to the shipbreaker’s yard in 1935. You can read more on “Launching Ceremonies”, “Pilots and Their Work” and “R.M.S. Strathmore” on this website.